Too many employees go to bed with a pit in their stomach every night and wake up wondering how they’ll deal with the day to come. Jason Lauritsen looks at the role that fear plays in employee engagement. Read this week’s feature article, Fear: The Real Challenge to Employee Engagement. It’s coming. You can expect to see initial recruiting offerings with Intelligent Non-Graphical Interfaces (think Siri or Amazon Echo) later this year. John Sumser just published a Definitive Guide to Employment Branding. Here are thirty-six different ways to Think About Your Data. On Episode 61 of HR Tech Weekly: Ultimate Software Connections Conference, HR software startup Culture Amp raises $10M more, and Algorithm Beats Humans In Hiring Candidates. 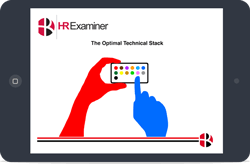 Listen to HR Tech Weekly. John Sumser talks with Mark Hornung, Senior Manager of Talent Marketing at big data company, Informatica. Listen to HR Examiner Radio. Let this piece serve as your warning. HR and Recruiting will need to understand non-graphic intelligent systems in the same way that you understand mobile tools. Hot off the presses. Here’s the guide to employment branding I authored recently. This week: Ultimate Software Connections Conference, HR software startup Culture Amp raises $10M more, and Algorithm Beats Humans In Hiring Candidates. John Sumser talks with Mark Hornung, Senior Manager of Talent Marketing at big data company, Informatica.